John Zagaria nods towards a black and white photo hanging by the register in his Vaughan butcher shop, Dolce Lucano. “That’s my father, Rocco,” he says, pointing to a youthful face standing behind a slain cow. He’s surrounded by a handful of beaming family members posing in a dilapidated, old-world setting – conditions that simply wouldn’t cut it by today’s strict sanitation standards. “That’s as crude as it gets,” Zagaria adds as he gazes fondly at the roots of his craft. Much has certainly changed since Zagaria’s father first learned how to wield the weighty cleaver that was once a standard tool of the butcher’s trade. That cumbersome blade – one only the brawny, dexterous hands of a master could brandish – is proudly displayed as Zagaria’s business logo. 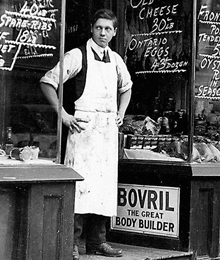 It’s both a nostalgic mark of the art’s evolution, and the time-honoured traditions that made butchers such integral parts of the community.